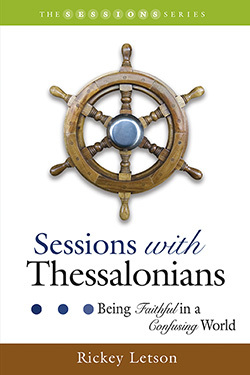 Sessions with Thessalonians is a ten-session study unit designed to provide a compelling preview to Paul’s letters to the Thessalonians. Each session is followed by a thought-provoking page of questions that allow for a deeper experience of the scriptural passages. These resource pages can be used by seminar leaders during preparation and group discussion, as well as in individual Bible study. Rickey Letson takes readers on a journey through Paul’s two letters to the Thessalonian Christians. Through our reflection on Paul’s words, we can see that his counsel to the Thessalonians in the midst of their confusion remains invaluable words for believers today who live in a world that is just as chaotic. Paul’s tools for navigation for the first-century Christians prove to lead us safe and true as well. Rickey Letson is Minister to Adults at Johns Creek Baptist Church in Alpharetta, Georgia. He is a graduate of Samford University and the Duke Divinity School. Prior to coming to Johns Creek, he served congregations in North Carolina and Kentucky. He and his wife, Ann Marie, have two children, Callie and Caleb.